Discover more about the fastest-growing engineering careers in the country! Join us at the Lunch with an Industrial Engineer on Saturday, Nov. 17, 2018! The Department of Mechanical and Industrial Engineering at UIC welcomes you to the Lunch with an Industrial Engineer on Saturday, Nov. 17, 2018. This event is for high school students and their parents/guardians to learn about our department's Industrial Engineering degree program, and the wide-range of careers open to graduates. Join us for an interactive information session, lab tours, and hands-on engineering challenges and learn how industrial engineers work in the real world. At the end of this exciting program, we will serve lunch and invite our faculty and student ambassadors to sit down with you and answer questions about MIE and UIC. Registration is open until Nov. 16, 2018, or until we reach maximum capacity. Click bellow to register now for the Luncheon. If the event reaches maximum capacity before the registration deadline, you will not be able to register, and we strongly recommend that you please contact Dr. Quintin Williams directly by email at qwilli1@uic.edu to be placed on the waiting list. Location: Energy Research Facility (ERF), Room 2039. Please note: All attendees must be invited to this event and registered to participate. Registration for the Nov. 17 event is open from now until Nov. 16, 2018 or until we reach capacity. If you have problems registering, or would like to be placed on the wait list after this time, please contact us immediately. Please allow an additional 15 minutes of travel time for the weather, construction, traffic, and navigating to the ERF building. The Department of Mechanical and Industrial Engineering is easily accessible by public transit and driving. For driving and public transit directions to MIE, visit this page. Free! If you park in our preferred lot, we can validate your parking ticket. Our preferred visitor’s lot is located in the northeast corner of Taylor and Halsted streets at 760 W. Taylor St., Chicago, IL 60607. Parking is free for this event if you park in our preferred visitors’ lot. 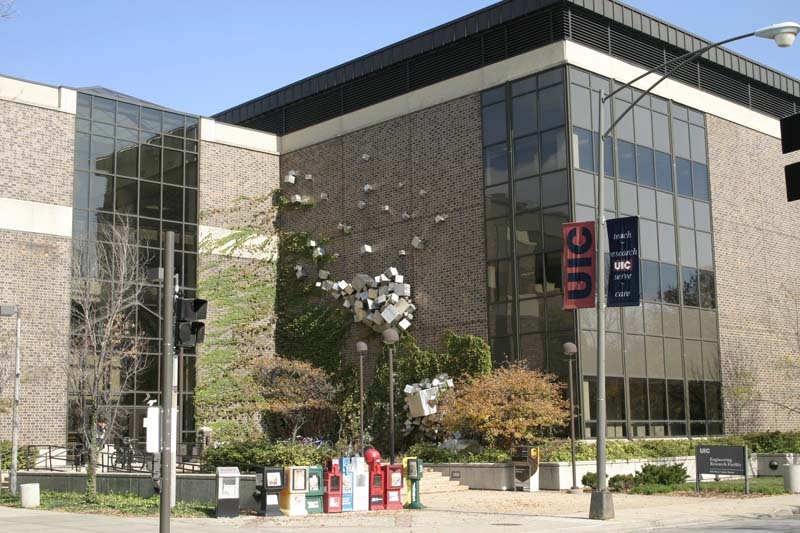 The four-level covered lot on the northeast corner of Taylor & Halsted streets (east of our building) is located at 760 W. Taylor St., Chicago, IL. 60607. At this time, we can only validate your parking for this lot, so please do not park elsewhere for the event, as we will not be able to reimburse your expense. When you have parked and arrived at the ERF Building, located at 842 W. Taylor St., Chicago, IL, 60607, please check in with one of our MIE Ambassadors, in the main lobby of ERF. Our Ambassadors will sign you in and validate your parking. The MIE Ambassadors are here to get you checked in for the event, and provide you with directions to the correct meeting areas, restrooms, and anything else you may need during your visit. This is the entrance to ERF on Taylor Street. As you walk in, look for the metal sculpture on the wall.